Massive Murano 11lb Iridescent Pink Glass Centerpiece Bowl Barovier Toso 10"
RETICELLO: netted filigree where the. usually with an air bubble in each. This is a great mid-century Murano Efeso glass vase made by Barovier & Toso in Murano, Italy ca 1960s. In excellent condition! For sale is a beautiful Venetian Art Glass Vase. Beautiful Murano footed art glass bowl. Swirled opaline white glass with applied gold flecked fruit and green trim. No label but I believe that it was made by Barovier & Toso. It is about 9 1/2" diameter and 6 1/4" high. No damage or repairs. Very Good condition. Please see pictures. Efeso Technique. By Ercole Barovier for Barovier & Toso. Overall, this Barovier & toso piece is in good condition considering the age. Murano origin. On one side, there is a water stain level inside vase, see picture # 6 and 7 - Minor. MURANO BAROVIER TOSO KNEELING BLACKAMOOR DOUBLE CANDLE HOLDER. CANDLESTICK --- VENETIAN GLASS. I am here to exceed your expectations! Blown glass in clear, blue, purple and green. 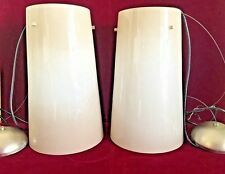 Notice the original Murano glass red sticker on the one lamp. Shades are not included. It works great. The base has two small nicks, on one top edge of the marble, that can be viewed in the last 2 photos. I take pride in taking all my own photos. So the item you see, is what you will receive. Large Murano Art Glass Barovier & Toso Cordonado Lamp Worth a Look! Up for sale here is Murano Art Glass large Cordonado lamp made by Barovier & Toso in the 60"s I believe. Its a older lamp and has a adjustable harp. The lamp to top od harp is 33" with glass portion being 18 1/2" all. It is a stark green color with ten murrinini of blue and orange coloring. It is clearly signed on the bottom "Design S. Malik". They taper to aprox 7" and are a beautiful earthy white to brown/beige murano glass. They have 3 small square box designs where the fixtures attach to the glass. They are model #6791- 12 V- Pendant fixture. The vase is cased black with white and grey stripes. It has a cut and folded back section along the rim to show it's red interior. This vase is featured on p.109 of Leslie Pina's book "Italian Glass Century 20". Vintage Mid Century Modern Barovier & Toso Murano Rugiadoso Art Glass Leaf Bowl! Just love the design, from a high end estate ! We have more rugiadoso art glass from this collection. Best Regards, Paul & Miguel. Signed by Barovier & Toso. Murano Glass vase. Signed on the base with original labels and complete with original box. Murano Glass Green with Gold Flecks Rays Bowl Ashtray. Green glass with gold fleck rays. Very thin layer of white semi-translucent glass on underside. Featured for your consideration is a magnificent Murano Art Glass Cordonato d'Oro vase from the Barovier & Toso glass factory. This stunning piece showcases thick walled glass heavily imbedded with 24K gold mica, and cased in clear glass. Up for sale here is a older Murano clown. 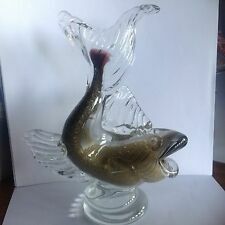 It has the red foil label on his feet which says "Genuine Venetian Glass made In Murano Italy". The clown has great color and take a look at his face. I believe this clown could of been made by Barovier & Toso. I am excited to present to you a gorgeous example of a late 60’s or early 70’s Murano glass piece. This chandelier has only one maker’s mark, but I have not found a match for it. The chandelier is in NEAR MINT condition with very little signs of use. Gold and blue glass. It is unsigned. Barovier & Toso Murano Glass vase. This vase would make a fine addition to any collection. Signed on the base with original labels. They all were inspired by Barovier's shorter, thicker pieces in a similar pattern, like this one, "graffito". Blue is the most famous color. This one is an unusual translucent white edged reddish orange with a palm frond pattern. The lamp glass is pink with internal rows of gold in the ribs known as cordonato d'oro. The lamp has a new lacquered brass base and hardware. There is also a new 3 way socket, cord, harp, finial and felt on the bottom of the base. The cased bowl with silver foil with three upturned edges and three down turned points. Each upturned side with a thick clear glass up pulled section. The base polished smooth. Italian, 20th century. It is made from clear aqua green colored efeso glass which is suffused with a multitude of bubbles! The handles have applied glass ruffles, which contrast nicely with the overall classic form. There is a pontil mark on the bottom. 2 1/2" LONG AND THE OTHERS ARE MUCH SMALLER.YOU CAN ONLY SEE THEM IF YOU HOLD IT TO A BRIGHT LIGHT. ABORIGENI vase by Ercole Barovier for BAROVIER & TOSO, Murano. 1951 circa. Bubbly overlaid. and those wishing to buy accept, unconditionally, the exclusion of any warranty for the object itself. Murano VenetianItalian Art GLass Pitcher. Made inMurano, Italy. Original Label. Barovier Toso. This special Murano treasure is in very good condition with wear including many scratches on the base. Sale is final. EXCEPTIONALLY EXQUISITE SCULPTURAL BOWL or ASHTRAY with WHITE SPIDER WEB or SWIRLING DESIGNS and FASCINATING GOLDEN SPECKLES. The silver flecks are under this colored layer, so it makes them look gold on the interior, but silver on the outside. Unmarked Murano. The glass section is cranberry bullicanti with swirl ribs and the glass is 8" tall x 6" wide. No scratches, nicks or breaks. There are 4 ceramic flowers, one of which has been repaired (see photos). "ZANETI OSCAR" Studio's Rare & Very Unique Hand Molded & Shaped Decorated Green & Clear Color blown glass with Gold flakes decor throughout. Amazing details, really gorgeous work of art. Murano Island, Italy Hand Made by Master Dude! I believe this to be an example of Ercole Barovier's Cordonato d'Oro pattern; possibly produced by Barovier & Toso. H: 11 1/2". 1959 circa. th Century Murano Glass. ”. excellent, only light scratches to underside. Vintage Murano • Venetian 🇮🇹 Italian ArT GLaSs Spiderweb Dish/Plate • Sommerso • Aventurine • Zebrato Made in Murano, Italy ~ Reasonable offers cheerfully entertained & often accepted! ~ OnMyWatch is proud to offer you this Italian Murano art glass plate, 20th century attributed to Barovier & Toso. Decorated with an amazing zebrato spiderweb style pattern, it is a stunning piece. An excellent addition to any art glass collection, or a thoughtful gift for a special person--including yourself! DIMENSIONS: 6¾" wide (17.15 cm) x 1" wide WEIGHT: 7 Ounces (200 g.) CONDITION: Free from any damage or restoration, perfect condition.